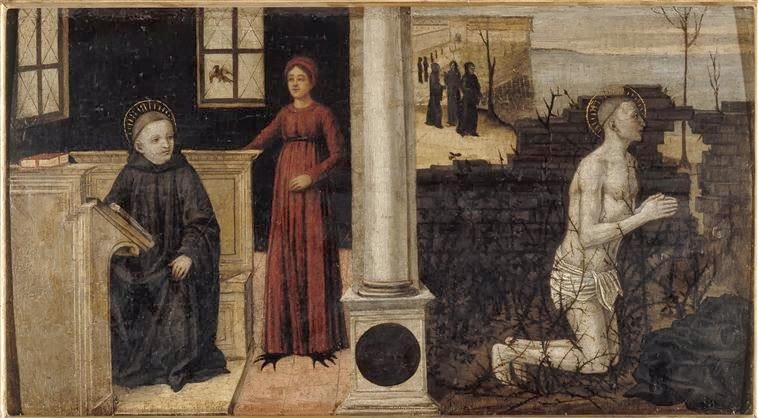 "Upon a certain day being alone, the tempter was at hand: for a little black bird, commonly called a merle or an ousel, began to fly about his face, and that so near as the holy man, if he would, might have taken it with his hand: but after he had blessed himself with the sign of the cross, the bird flew away: and forthwith the holy man was assaulted with such a terrible temptation of the flesh, as he never felt the like in all his life. A certain woman there was which some time he had seen, the memory of which the wicked spirit put into his mind, and by the representation of her did so mightily inflame with concupiscence the soul of God's servant, which did so increase that, almost overcome with pleasure, he was of mind to have forsaken the wilderness. But, suddenly assisted with God's grace, he came to himself; and seeing many thick briers and nettle bushes to grow hard by, off he cast his apparel, and threw himself into the midst of them,and there wallowed so long that, when he rose up, all his flesh was pitifully torn: and so by the wounds of his body, he cured the wounds of his soul, in that he turned pleasure into pain, and by the outward burning of extreme smart, quenched that fire which, being nourished before with the fuel of carnal cogitations, did inwardly burn in his soul: and by this means he overcame the sin, because he made a change of the fire. Many after this began to abandon the world, and to become his scholars. For being now freed from the vice of temptation, worthily and with great reason is he made a master of virtue: for which cause, in Exodus, commandment is given by Moses that the Levites from five-and-twenty years and upward should serve, but, after they came to fifty, that they should be ordained keepers of the holy vessels. PETER. Somewhat I understand of this testimony alleged: but yet I beseech you to tell me the meaning thereof more fully. GREGORY. It is plain, Peter, that in youth the temptation of the flesh is hot: but after fifty years the heat of the body waxeth cold, and the souls of faithful people become holy vessels. Wherefore necessary it is that God's elect servants, whiles they are yet in the heat of temptation, should live in obedience, serve, and be wearied with labour and pains. But when, by reason of age, the heat of temptation is past, they become keepers of holy vessels; because they then are made the doctors of men's souls. PETER. I cannot deny, but that your words have given me full satisfaction: wherefore, seeing you have now expounded the meaning of the former text alleged, prosecute, I pray, as you have begun, the rest of the holy man's life." Nowadays we are probably apt to consider the teaching in the picture as rather quaint and "medieval" and possibly "naive"
In any event the constant bombardment of sexual images from all sides and in all walks of life especially as a means to sell merchandise is a sad fact of life. It is now, as they say, "the culture"
But the important words in Gregory`s Dialogues are overlooked: "suddenly assisted with God's grace". But behind this tale and this picture is a rather complex and sophisticated view of the nature of sin, penance and reconciliation. "1... In baptism we die as Jesus died on the Cross, and this is the fundamental basis of all Christian penance. 2. The New Testament denotes the Cross of Jesus Christ with concepts such as vicarious representation, sacrifice, atonement. All these concepts are nowadays poorly understood by a great number of people and hence must be carefully deciphered and interpreted. In an introductory and preparatory way this can be done by pointing to the solidarity itself of human life: the being, deeds, and omissions of the other and the others affect the individual in his own being and doing. In this way, a new understanding can be reached of the fact that by his obedience and his self-surrender “for the many”, Jesus Christ’s work of redemption becomes fully understandable only if one adds to this that in Jesus Christ God himself has entered into the condition humana. In this way, through the Person of the God-Man Jesus Christ, God has reconciled the world to himself (cf. 2 Cor 5:14, 17). Redemption from sin, otherwise known as the forgiveness of sin, takes place therefore by means of the admirabile commercium. God has made “the sinless one into sin so that in him we might become the justice of God” (2 Cor 5:21; cf. Rom 8:3f; Gal 3:13; 1 Pet 2:24). “In the human nature united to himself the Son of God, by overcoming death through his own death and Resurrection, redeemed man and changed him into a new creation” (Lumen Gentium 7). “By the very fact that human nature was assumed, not absorbed in him, it has been raised in us also to a dignity beyond comparison. For by his Incarnation, he, the Son of God, has in a certain way united himself with each man” (Gaudium et Spes 22; cf. International Theological Commission, “Select Questions on Christology” ). 3. Christian penance is a participation in the suffering and death of Christ. This comes about per fidem et caritatem et per fidei sacramenta (St. Thomas Aquinas, STh III, q. 49, a. 3 ad 6). Christian penance has its foundation in baptism, which is the sacrament of conversion for the forgiveness of sins (Acts 2:38) and the sacrament of faith. Therefore, it should have a determining influence on the entire Christian life (cf. Rom 6:3ff.). Christian penance must therefore not be understood in the first place as an ethical and ascetic event but as basically sacramental, viz., the gift of a new existence, granted by God, which also urges ethical and ascetical practice. It should not only take place in individual acts, but it should also characterize the entire Christian life. In this statement the justified concern of Luther’s first thesis on indulgences, 31 October 1517, is also intimated. As a matter of fact, penance should not be reduced by being considered in a personal isolation. Following Jesus as it does, it must be understood both as obedience to the Father and as a vicarious service for the others and for the world." Most images can be enlarged by simply clicking on the picture concerned Or by right click and then pressing "Open in new tab" or "Open link".